A carjacker who targeted a 90-year-old man as he returned to his car in a Birmingham park has been jailed. Mohammed Subhan, 19, was one of three teenagers who attacked him and made off from Kings Heath's Highbury Park in the driver's Vauxhall Corsa. 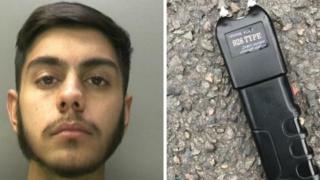 Subhan was arrested after crashing the car and was found in possession of a stun gun. He pleaded guilty and was jailed for 32 months. Police are still investigating several carjackings in south Birmingham. The victim was left with a bruise to an eye and a cut to his finger, the West Midlands force said. He spoke to a woman in the park and she called police. About half an hour later two traffic officers spotted the Vauxhall Corsa on Kingswood Road, just over a mile away from the robbery, which happened at about 11:10 GMT on 17 March. One of the teenagers and a female fled from the vehicle. Subhan reversed down the street with the car doors open before crashing into a vehicle travelling up the road. He fled but was caught by a police officer. Subhan admitted robbery, possession of a stun gun, aggravated vehicle taking and use of vehicle without insurance and was jailed at Birmingham Crown Court on Monday. The case against the 16-year-old boy and 14-year-old boy was dropped. Det Con Tom Lyons, from Force CID, said it was "grateful to the member of the public who helped the victim" and Subhan "showed no remorse on his arrest".